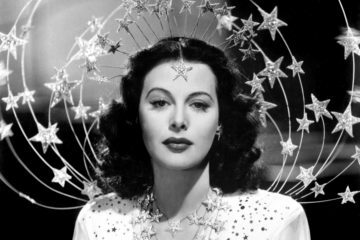 As a child, Dessa Lohrey loved keeping a diary, and her fascination with them became further peaked when she stumbled upon her own fourth grade journal. 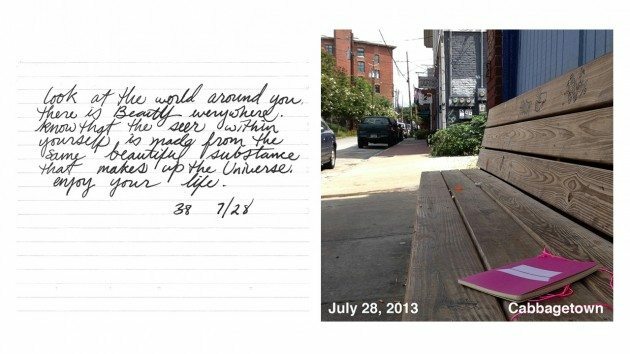 Thoroughly entertained by the fearlessness and honesty captured, Dessa wondered, “what would happen if people were invited to share their inner most thoughts with others?” With that, the Bench Diary project was born. 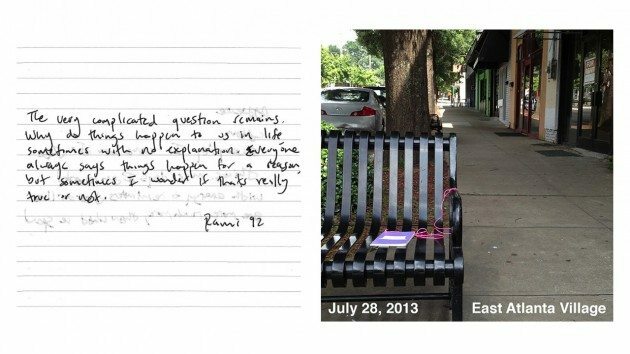 On a hot day in June 2013 in Atlanta, GA, armed with a ball of string, scissors and pens, Dessa tied four diaries to benches around the city, inviting her neighbors to write in them. 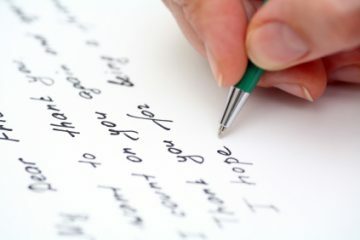 Upon collecting the journals later that day, she was delighted to find that each one contained multiple entries, including wonderful poems, stories and drawings from both adults and children. 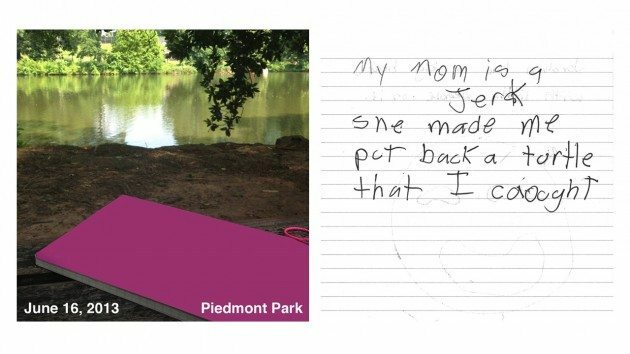 “I hope to inspire fearlessness in people who write Bench Diary entries and in people who read those entries.” Inspired by the responses, and wanting to learn more about her neighbors, Dessa has continued to place diaries throughout the city, and to date has received over 90 entries written on a wide range of subjects. 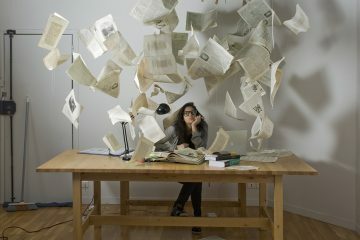 “Returning in the evening to retrieve each diary is a thrill, as I never know what to expect. I have been blown away by what my neighbors have chosen to share with complete strangers, and I cannot help but wonder what people in other cities and countries have to share,” said Dessa about the impact the project has had on her so far. 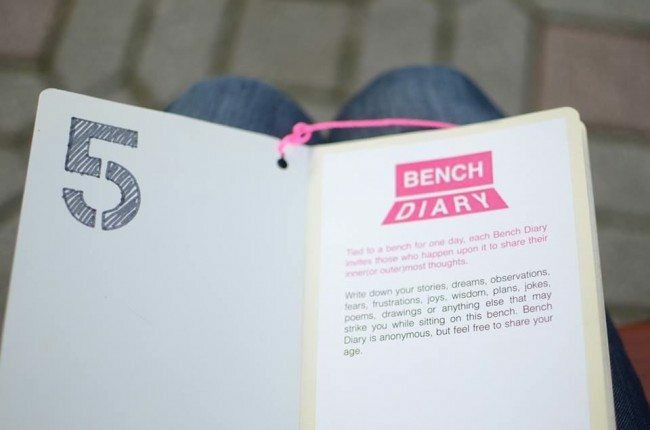 In a world where we are seemingly so disconnected, Bench Diary reminds us that it’s often the simple things that can have the most impact. 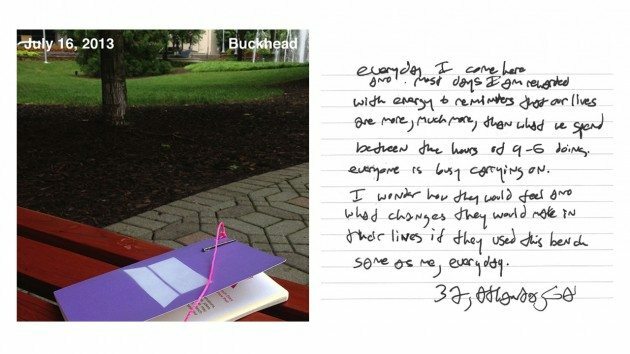 If you are interested in getting involved with the project by putting out Bench Diaries in your city, you can contact Dessa at [email protected]. You can also follow the project on Instagram, Twitter and Facebook. Born and raised in Knoxville, TN, Dessa, 26, moved to Atlanta to study at Georgia Tech, where she earned a bachelor’s and master’s degree in architecture. 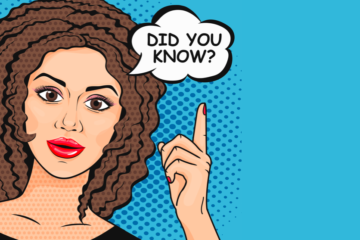 When she is not working on her architectural pursuits or the Bench Diary project, she enjoys dabbling in graphic design, photography and filmmaking. You find such varied and interesting “stories” to post on your website.